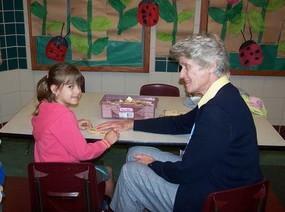 Quaker Valley School District brings older adults together with the younger generation through the Generations Together Program. This program was developed at the University of Pittsburgh under the direction of Dr. Sally Newman. It has been in existence at Quaker Valley since 1994, under the supervision of teacher Polly Will. Quaker Valley currently has volunteers working with children at Osborne and Edgeworth Elementary Schools. Typically these older adults spend three hours each week working with small groups of children under the supervision of a classroom teacher. They might help with spelling words, listen to children read or play a learning game. Many of our volunteers have been here for at least five years and are an integral part of our learning experience.